This USB Interface allows you to operate the Robotic Arm Edge kit from your computer. The Robotics Arm Edge Kit is a fantastic project that works with a wired remote. 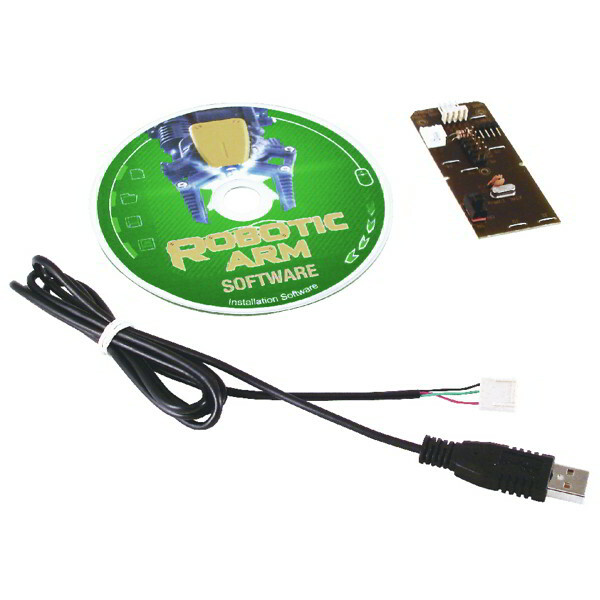 This USB Interface kit allows you to operate all features of the robotic arm using your Windows PC. The included software will run on Windows XP, Vista and Windows 7 32 bit and 64 bit versions. Sadly it will only run on the 32 bit version of Windows 8. Users with 64 bit Windows will need an additional download. Advanced users have been able to transform this hackable kit to work with Mac, Linux, Raspberry Pi and other platforms. This set includes the Robotic Arm USB Interface board, a CD with Windows PC software and a USB cable.